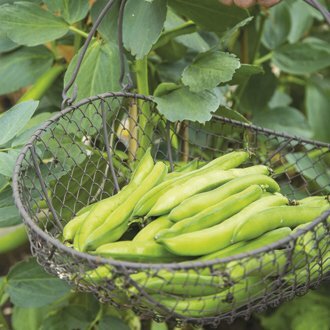 The world's first autumn-cropping broad bean, so you can enjoy the unique flavour of this great favourite for even more of the year. The 25cm-long pods contain between five and seven beans, and their flavour is particularly good. The seed can also be autumn-sown to produce an early summer crop of pods. Sow outdoors October to December, March to May or June to early August. Double rows, 2ft/60cm apart. Where more than one double row is sown allow 2ft/60cm between them. Spacing 9in/23cm between plants. Harvest: October to December sowing from June onwards. March to May sowing from July onwards. June to August Sowing from September to October (may require protection from first frosts). Suitable for freezing.